Kindly let me know on how to change the Header or Edit the Header in the Neos tool. Do you mean that you can not edit the “Service is very important to us” by clicking on it? No I am not able to edit the above header which has home , daimler , etc links. I want to add the HTML elements to them like changing the background color of header , etc. That’s your menu, which you have configured via Fusion. Or by just specifying in the page node inspector, which of them are hide in menu. By default, all nodes are included in the navigation menu. 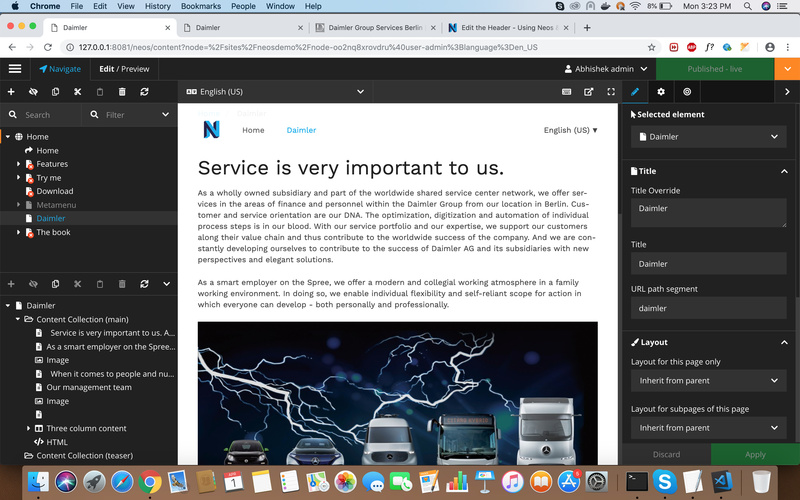 If the nav menu should not reflect the page tree, then you indeed need to configure this via Fusion or inside your page template.